We believe in having a passion for your job, and for us, it is about getting the best results for our clients and staying ahead of the curve. We believe in providing a friendly and caring environment where you can trust that your feet are in the best hands. We also believe in making you feel at home so that you can leave any fears behind. After all, feet are our passion. 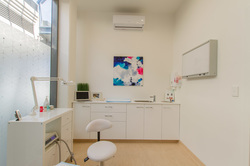 Starting out as a small podiatry clinic on St Bernards Road Magill, Podantics has grown to include two clinics in the Adelaide Suburbs of Magill & Hyde Park, an online information hub and its own range of creams and foot products. Podantics Podiatry focuses on high quality foot care and solutions for Adelaide's foot problems. We endeavor to be at the cutting edge of all aspects of podiatry including skin care, nail care, sports, diabetes and biomechanics. Sports podiatry is the treatment of foot, ankle, leg and knee injuries by altering lower limb function using a variety of methods, including insoles, orthotics, footwear, stretching and exercises. With our gait analysis system, our podiatrist's can analyse the way an individuals foot strikes the ground and evaluate the chain of motion of the major joints in the leg from the ground up. By analysing the way that you walk and run the our podiatrist's will evaluate whether or not there are any mechanical reasons that may be contributing to your injury and work to correct them if needed. Our "Medi-Spa" Pedicures and Foot Massages were started by our Adelaide Podiatrist's to make feet healthy and beautiful again. The idea began as an attempt to make young women enthusiastic about their foot health. Within months the concept became so popular that our Unley Road "Pedicure Room" was born. Our Medi Spa is the first of its kind combining fashion forward ideas with traditional podiatry values on health and safety. We provide removal of corns and callus, and treatment of nail disorders in a non-threatening pedicure environment. By combining the pampering and ambiance of a high end nail salon with the hygienic standards of a medical clinic, we offer a safe alternative to the traditional nail salon for both men and women. Click here for a list of our Medi Spa Foot Treatments or go to our contact page to book an appointment. Podantics Podiatry believes in providing you with the best care possible and is focused on providing you with solutions to your foot health concerns. We offer a range of additional services including an on site doppler ultrasound for vascular assessment, the ability to do in house nail operations, digital gait analysis, therapeutic ultrasound, prolotherapy, and an orthotics lab for use as required. Podantics Podiatry recommends thefootshop.com.au for all your foot care needs.